If you really want to make more money as a virtual assistant, having project management skills will help you get there. You can start managing projects for your clients and command higher rates. You can grow your own team for your business and start a virtual assistant agency. Project managers generally make six figure salaries working for large fortune 500 companies. It is one of the higher paying professions. The reason why they get paid so high is because projects are used to create products for companies. And new products mean more revenue and profits for the business. Whenever you are part of the revenue generating side of a business, you can get paid more because you are helping to bring in more money for your clients. Its that simple. In addition, managing projects is not for everyone. It takes a special type of personality to do this work. As a project manager you have to manage a team of other people, you have to coordinate and bring them together, you also have to make sure the team is working together towards the same goal. A big part of a project manager's job is to do risk management. Which basically means that you need to have different backup plans for the issues that come up. People won't always cooperate perfectly. A team member will say they are going to get something done by Friday, and when Friday comes the work is not finished. The main website gets hacked and is down for 3 days. Another major area of project management is effective communication. This usually requires team meetings. You can't just rely on emails. It takes good people skills because that is what you are doing as a project manager. A lot of people aren't even good at this. Product launches (ebooks, virtual summits, courses, new membership sites, coaching programs). There is also a huge demand for project managers in service based businesses. So for example, if you work for a website design, a graphic design agency or a translation company you need to manage their client delivery work. Each month these companies have to deliver finished websites, graphic images and complete translations to their customers. They rely heavily on project managers to communicate with clients and to ensure that the team is delivering the work as promised in the original contract or Statement of Work (SOW). As you continue to offer virtual assistant services, you will come to see very quickly that there is a limit on how much money you can make working alone. Unless you work 12 hours each day, it will be very difficult for you to go past 5 figures a year. In order to make more than 6 figures, you will have to outsource some of your client work to other people. This is where you need to have good project management skills to manage your own team members. You can start your own virtual assistant agency with multiple people working underneath you. You can either be the project manager interfacing with clients or you can appoint people that you trust to do that. In this situation, you have the potential to make a lot of money and work less hours. As you can see, project management is essential for the grow of your virtual assistant business. 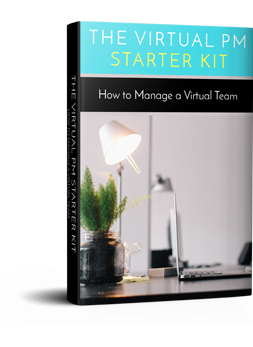 You can learn more about what a project manager does with this free Virtual PM Starter Kit.